Berea Lutheran Church in Inver Grove Heights, MN will be celebrating this anniversary with a special worship service at 9:00 a.m on Sunday, October 29, 2017. Following this service of Word and song, the children of Berea Lutheran Church & School will present a play reviewing the history of Martin Luther and the Reformation. We welcome all to come and hear this message of salvation by grace and our Lord’s preservation of His Word! Grace Lutheran Church in Fridley, MN will also hold a 500th Anniversary of the Reformation Service at 10:00 a.m. 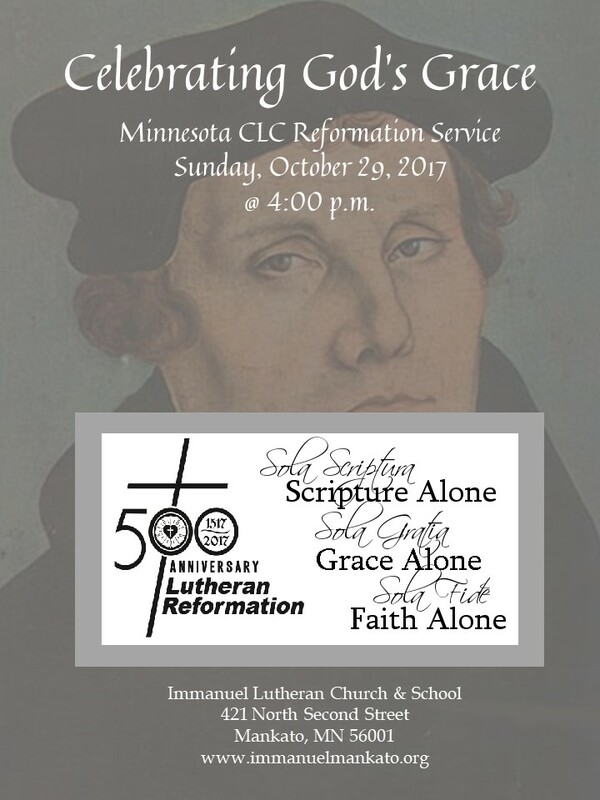 In addition to our Twin Cities CLC Lutheran church individual services, a joint Minnesota CLC Reformation Service will be held that same Sunday at 4:00 p.m. at Immanuel Lutheran Church in Mankato, MN. This entry was posted in Events and tagged Martin Luther, Reformation. On July 24-28, 9:00-11:30 am. 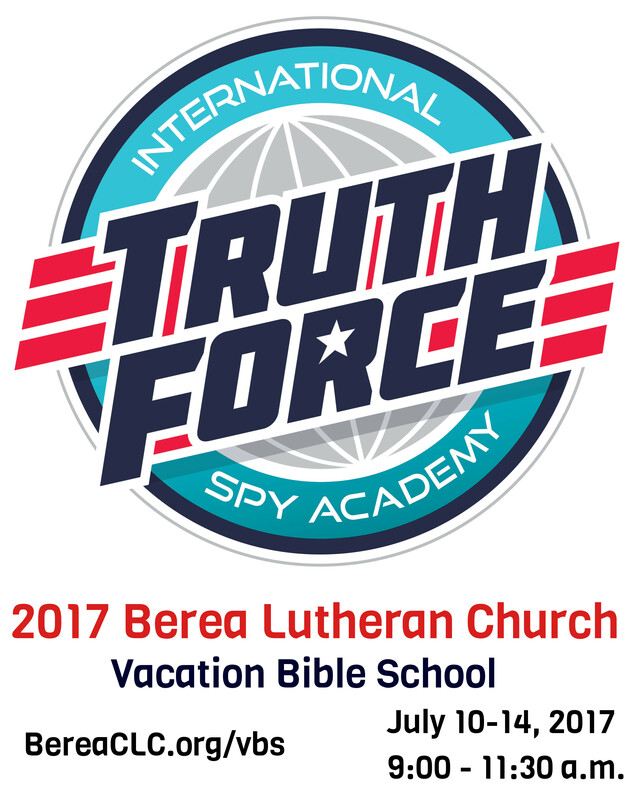 Berea Lutheran Church‘s 2017 Vacation Bible School is International Spy Academy – become an agent of the one true God! Join us for Bible study, daily contests, crafts, snacks, music and games! 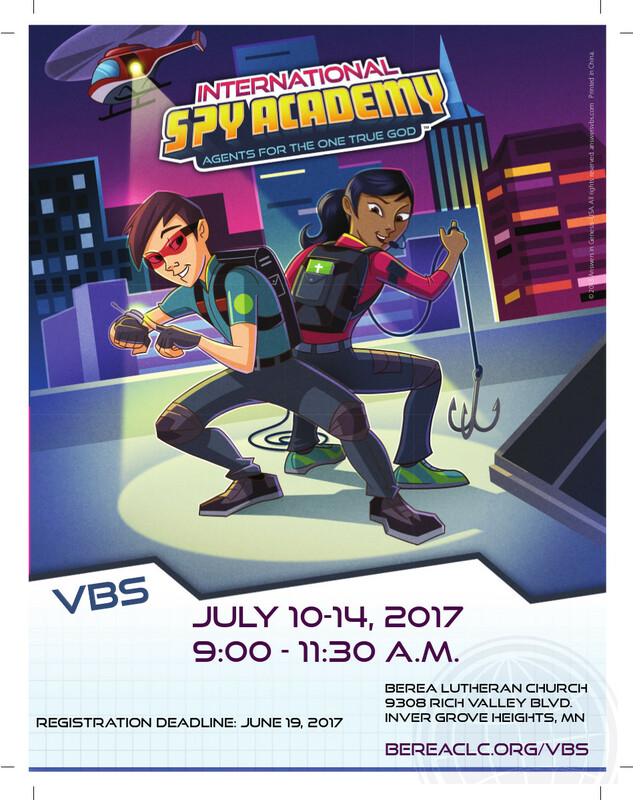 July 10-14 from 9-11:30 a.m.
VBS is open to ages 4 – 14. Register online at bereaclc.org/vbs. Contact us at berea@bereaclc.org or 651-454-1915. This entry was posted in Events and tagged VBS. Grace Lutheran Church and Berea Lutheran Church will be working together to offer a Thanksgiving Eve service and a Thanksgiving Day service. We pray this service will be a blessing to you as we thank our Lord for the many blessings he has bestowed on us! Join us for a Thanksgiving worship service! Berea Lutheran Church will be hosting the MN Church of the Lutheran Confession area Reformation Service on October 30, 2016 at 4:00 p.m. Come rejoice with us in the Lord’s faithful preservation of His Word and His help and guidance since Martin Luther’s nailing of the 95 Theses on the Wittenberg Castle church door.